(Phys.org) —A team of Harvard University physicists has proposed the possible existence of a type of dark matter not described by current physics models. In their paper published in the journal Physical Review Letters, the team suggests it's possible that not all dark matter is cold and collision-less. In the visible universe, galaxies form into a disk shape—the Milky Way is a good example. All of its members align roughly along a single plane, this due to the forces of gravity and spin. Objects form into masses which, over time, spread out into a disk shape. Dark matter, on the other hand, appears to hover around galaxies like a halo, at least according to current models. It's seen as dark, cold and with so little energy that dark matter particles rarely if ever run into one another. 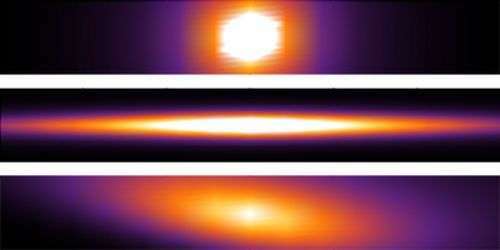 The researchers in this new study suggest there may be other types of matter, however, that behaves more like visible matter. And, because of that, they suggest it could bunch up due to dark-matter-type gravity and form disks as well. These disks, which they describe as dark matter component double-disk dark matter, could represent as much as 5 percent of all existing dark matter. For dark matter to clump, it would need to have other properties similar to visible matter as well. For that reason, the researchers suggest it's possible that there exists dark atoms, dark photons, and likely some form of dark electromagnetic force as well. Research on dark matter over the years has led to a model that describes dark matter as existing in a ball shape—galaxies sit in the middle of the ball, which would mean observers living in a galaxy would "see" it as existing everywhere around them. But it's possible that other types of shapes exist as well, the researchers suggest, because there are other types of matter in the visible universe. They note that baryonic matter (matter made of strongly acting fermions known as baryons) is believed to make up approximately 5 percent of all matter in the known universe. For that reason, they conclude that it would appear likely that similar differences in dark matter would occur as well, and perhaps in nearly equal proportions. If true, it would mean there could be whole dark galaxies out there, undetectable, yet as real as those we can see with the naked eye. Much more research will have to be done in this area before adding such types of dark matter to models in general use, of course. Until then, it will remain an abstract theory. We point out that current constraints on dark matter imply only that the majority of dark matter is cold and collisionless. A subdominant fraction of dark matter could have much stronger interactions. In particular, it could interact in a manner that dissipates energy, thereby cooling into a rotationally supported disk, much as baryons do. We call this proposed new dark matter component double-disk dark matter (DDDM). We argue that DDDM could constitute a fraction of all matter roughly as large as the fraction in baryons, and that it could be detected through its gravitational effects on the motion of stars in galaxies, for example. Furthermore, if DDDM can annihilate to gamma rays, it would give rise to an indirect detection signal distributed across the sky that differs dramatically from that predicted for ordinary dark matter. DDDM and more general partially interacting dark matter scenarios provide a large unexplored space of testable new physics ideas. What I have not seen explained is, if there is "cold and collisionless" dark matter, then how come it doesn't all go to the center, causing a black hole, or at least something that can be readily observed? If it is affected by gravity in a manner similar to ordinary matter, it would fall to the center, eventually, unless some other energetic interaction occurred in order to keep its inertia sufficient to provide a stable orbit. If the dark matter exists in the form of galaxies comingled among visible galaxies, we could observe gravitational lensing in unexplained locations of the universe where fewer than average densities of visible galaxies exist. Or, do we not see such lensing because dark matter galaxies are so much less dense than visible ones implying there is not enough gravity within dark matter galaxies to create lensing? For that reason, the researchers suggest it's possible that there exists dark atoms, dark photons, and likely some form of dark electromagnetic force as well. LOL! And the "dark ages" continues....beware of the dark side. Perhaps the frustration of some physicists with the annoying persistence of the "dark sector" has lead to their developing a dark psychological condition: Dark Mind. This condition can lead to some of the dark imaginings apparent in the referenced paper. Or as one of Pink Floyd's lyrics state, "There is no dark side of the moon; it's all dark." why could 'dark matter ' not simply be unilluminated dust and debris? Because the required amount of "dust and debris" would not be able to remain "unilluminated" in spaces where the dark matter is showing up, ie, galaxy halos and cluster halos. Because it has angular momentum. If it's collisionless, even if it goes straight to the center, it won't stop there. It will follow an orbital trajectory. My recent experiments with "Lightly Sprinkled Dark-Matter" (LSDm) leads me to surmise that through the effects of Repulsive Neutrons™ on "Boring Ordinary Matter" (BOM) in the event of a Senile Neutrino collision with a BOM particle coinciding with a repulsed neutron event, DDDM (Deep Dish Dark Matter) will be created; The extent to which the DDDM may be polluted with Anchovions and Pions depends on the mixing angle. The presences of a a sufficient amount of Anchovions will preclude the DDDM from being consumed by a Black Holes as are repelled by Anchovions. As I created the anagram DDDM before these clowns stole it, any awards, kudos, acclaim etc... should rightly go to Me. Antialias where are you? Your insightful comments are needed! And the "dark ages" continues....beware of the dark side. Seriously, I've read the article and i'm not really sure what to make of it (even though it sounds very interesting). Dark matter itself is already a concept that has a lot of free variables left to determine (that's why it's called 'dark'. Not merely because we can't see it). So adding a second type seems currently a very dicey proposition. It's a bit like with postulating a zoo of Higgs bosons before the Higgs boson was discovered. There is a one-Higgs-bonon theory, so we had to first find one...THEN it was sensible to start thinking about alternative theories with more than one. Postulating a subdomain if we don't know about the domain is premature. So I'm really holding back on this one until the results from the current detector setups comes in. But strangely it found it's way to being clustered around galaxies. If it were completely without interaction other than gravity, why would it have clustered in the first place and not just passed through the galaxy speeding up on the way in and slowing down on the way out? In AWT based on dense aether model the normal gravity field manifest itself with local deficiency in scalar wave density The dark matter particles are formed with local excess of gravitational "scalar" waves instead, which are shielded around massive objects with neighboring massive objects. The solitons of these waves are well known neutrinos, which are forming at highest concentration/energy density of these scalar waves. This model is supported with preferred formation of dark matter at the connection lines of another massive objects (dark matter streaks and fibers), with Allais effect and another gravitational anomalies during eclipses. The scalar waves do behave like less dense blobs of vacuum and they do propagate with superluminal speed. The neutrinos do appear like the bubbles, i.e. the hollow places of vacuum surrounded with more dense exterior, so their net lensing effect is negligible with compare to their inertia (they do violate the equivalence principle). In dense aether model the normal photons are solitons of transverse waves with weak scalar wave component, so they're attracted to gravity field at the place, when the curvature of space-time becomes positive. The neutrinos are solitons of longitudinal waves with weak transverse wave component, so they're attracted to gravity field at the place, when the curvature of space-time becomes negative. It means, the dark matter is still concentrating around massive bodies, but it keeps itself at distance. In addition, the neutrinos represent the missing antimatter of the universe, as they do represent the most lightweight particles of it. Add another new epicycle to the list propping up the Big Bang theory. In the interest of science growth to catch-up with dimensional knowledge base-creative spirit must pravail upon the scientific community.search Origins- Cosmology Vedas. clearly define Cosmic function of the Universe.Plasma Regulated Electromagnetic Phenomena in magnetic field environment -see projections in my books.Interaction welcom on JNANAM Udbhavam-Knowledge Base creation-2013. A team of Harvard University physicists has proposed the possible existence of a type of dark matter not described by current physics models (BIG SNIP)...and likely some form of dark electromagnetic force as well. Mainstream science can't deal with the theoretical ramifications of scaled-up versions of repeatable electrical/electromagnetic phenomena, and yet are willing to entertain seemingly endless fantasies like this, including - irony of ironies - a completely fictional and totally unnecessary "dark electromagnetic force". This isn't "science". This is well-funded, baseless, idle speculation. Ockham's Razor would imply that, since the "current constraints on dark matter imply only that the majority of dark matter is cold and collisionless," the paradigm of dark matter needs to be modified. It does not require the proliferation of additional entities. Consider that inelastic collisions need not follow the standard physics of atomic gases. Collisions of any variety would produce heat, inelastic collisions would produce tighter/denser clumping AND heat where none is inferred by observations. This is where "dark energy" comes in, collisions of dark matter produce dark energy (seems obvious that DM converts to DE, they're both "dark"). Gravity pulls the DM in, DM collisions produce DE which causes an expansion of space-time gravity wells which curves the space-time in the area of the collision. These remnants of DM collisions create a matrix of space time gravity wells which interact with hyper-dimensional properties of DM to convert the "Dark Heat" (DH) into to the usable DE. The accelerating expansion is due to the increased collisions of the DM creating excess DH, essentially the Universe is blowing itself up like a balloon. Erm. Just because both have the label 'dark' doesn't mean they're related - and these two concepts are derived from entirely separate observations.